Friendship Tea: Teapots in the Bathroom? Several years ago GJ, my wonderful husband, decided to enclose the unused patio off our bedroom to make a large laundry room. I love it. It is the most convenient location for a spacious laundry room. But, by doing so, I lost the window in my bathroom. After some consideration, the hobby carpenter concluded the easy solution to closing off the window would be to make a shelf from it. When the shelves were completed I pondered over what to put put on them and he said, "surely you have some teapots or baskets you can put on them!" Teapots in the bathroom? That sounded a little impractical, but as I looked around at my many teapots, I realized several tea-for-one teapots received as gifts were just sitting around here and there. I don't use these for tea, but they are pretty to display, and yes, even in my bathroom! That's a wonderfully unique idea. 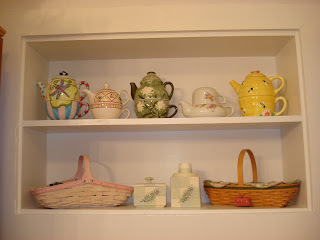 I have quite a few little tiny teapots that people have given me (and keep giving me) and I've not been sure what to do with them, but a shelf in the bathroom might be a great way to display them, especially in my hall bathroom that has a patchwork quilt for a shower curtain.